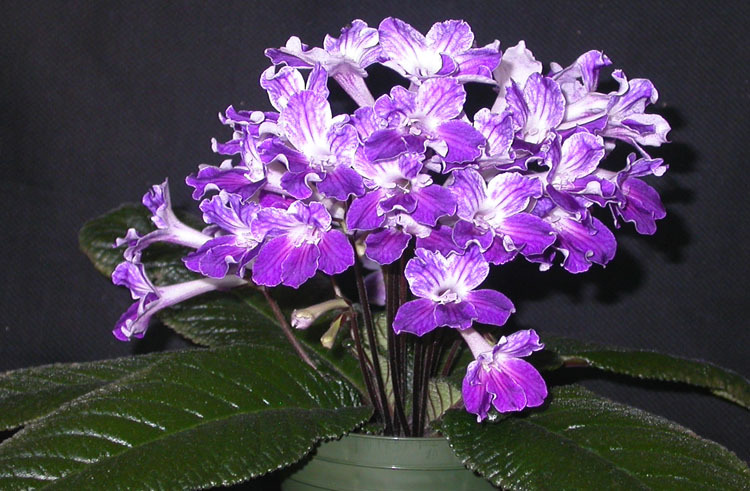 Streptocarpus ‘Heartland’s Peacock’, 2011, IR111160, Dale Martens, IL. (S. ‘Fernwood’s Minuet’ x S. ‘Nerys’). Fertile as seed parent only, reproducible only vegetatively. Rosette. Leaves bullate, dark green, with red veins below, 210 mm long x 70 mm wide with 20 mm petiole, linear with crenate margin, acute tip and cuneate base. Calyx split, green and maroon, 4 mm long. Peduncle very stiff, 110 mm long with 5-7 flowers. Corolla salverform, 50 mm long x 33 mm wide, white exterior, upper lobes white with lavender netting, lower lobes lavender with pale lavender streaks, anthers mutated into extra petals. Best Gesneriad, 2011 Northern Illinois Gesneriad Society Show.